Links to the Working Drawing Sets at the bottom of this page only work if your browser is Internet Explorer. Firefox, Safari Chrome and other browser users are asked to click on either of the first 2 links directly below to see an example of a working drawing set viewable in their browser. 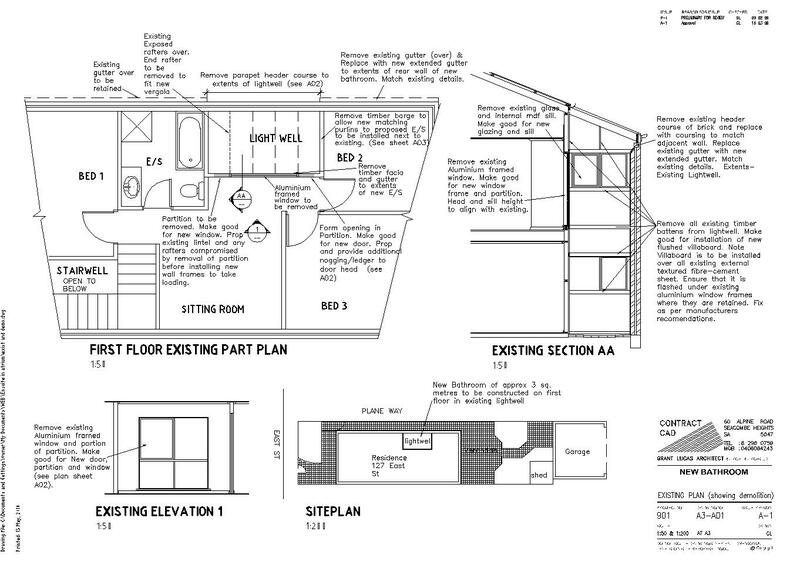 This documentation set was for a modest Kitchen extension in the Heritage suburb of Colonel Light Gardens. The Working Drawing set cost $3000. The construction cost was around $70k. The rear of the original bungalow was opened up and the existing Kitchen was doubled in size to provide an eat in Kitchen/family room for a growing young family. A simple verandah was constructed in front of the of the kitchen which incorporates a large glass bi-sliding door opening out onto the garden. This documentation set was for a new Cafe / restaurant on the ground floor of an existing multi-story building in the heart of Adelaide. The Disability Discrimination Act required that new Access ramps and stairs were needed to get Development Approval. 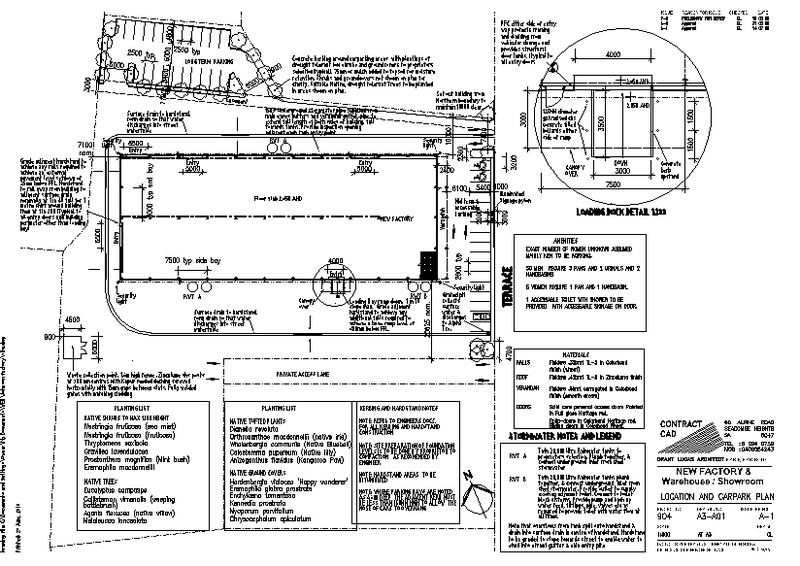 A new shopfront was proposed to help permeability through to the adjacent Mall. This Working drawing set cost $4500. The original documentation cost for this Working Drawing set came in at around $2500 but additional design changes were made by the client after the drawings were completed. The location and number of ramps and doorways changed several times and blew the final documentation cost out to almost $4500. This is not an unusual breakdown of where the money is spent in the documentation of any building project, either domestic or commercial in nature. It is usually the client changing their mind as to the direction or scope of the project that results in a large portion of the overall cost. Changes at the end of a project are usually more expensive than those at the beginning. Clients trying to save money by not spending some time with me on the preliminary or sketch design stages will invariably end up spending even more at the end of the project due to last minute re-designs. Remodeling of existing courtyard into a new living area. Magryn & Associates provided engineering. The clients saved some money on the drawings by doing their own site measurements and a construction inspection of their existing roof. This reduced the amount of site visits I required. 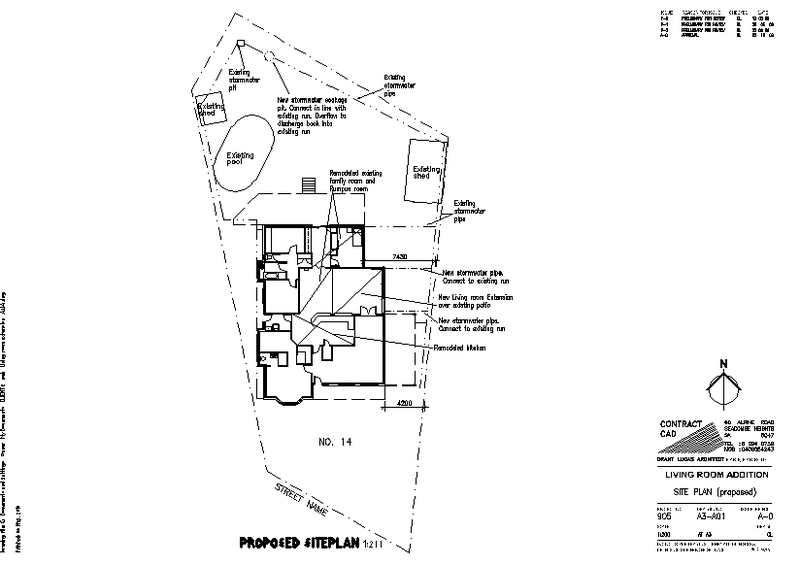 Total cost (GST inclusive) for architectural work to produce this Development Approval drawing set was $6,999. Roofspace Conversion. Bedroom /living room plus bathroom for 2 Teenagers in an existing roof-space. Magryn & Associates provided engineering. A prolonged design phase with several options for the clients including a 3d model was included in this job. Total Cost GST inclusive for the architectural work to produce this Development Approval drawing set was $8,890. An existing rental townhouse. A first floor bathroom was added to service 2 bedrooms. The new bathroom cantilevers into the existing 2 story light-well and a new vergola roof across the remaining light-well forms an all-weather courtyard below. Magryn & Associates provided engineering. Total cost GST inclusive for the Architectural work to produce this Development Approval drawing set was $2,844. An existing Factory/Warehouse to be renovated with new wet areas and mezzanine office. A new Showroom/sales module designed so the business addresses the street. On 2 titles, the design is mirrored on the common boundary for rental/sales flexibility in the future. Several design options were explored, a 3d model made and a shadow and car-parking study was required by council to get Planning Approval. Total cost (GST inclusive) for architectural work to produce this drawing set was $12,500. A new 3000 sq. m aluminium window fabrication and powder-coating plant. Provision for showrooms/ offices at the front as stage 2. This job was at a remote country location. To save on costs the client emailed site specific information to me as I required it, negating any need for a site-visit. Total cost (GST inclusive) for architectural work to produce this Development approval drawing set was $10,800. An existing office servicing a large factory required a new managers office and Boardroom. This was accommodated as a new mezzanine level within the existing 6.5m high office module. Hufcor Moveable walls were used to keep the design flexible. Magryn & Associates provided engineering. 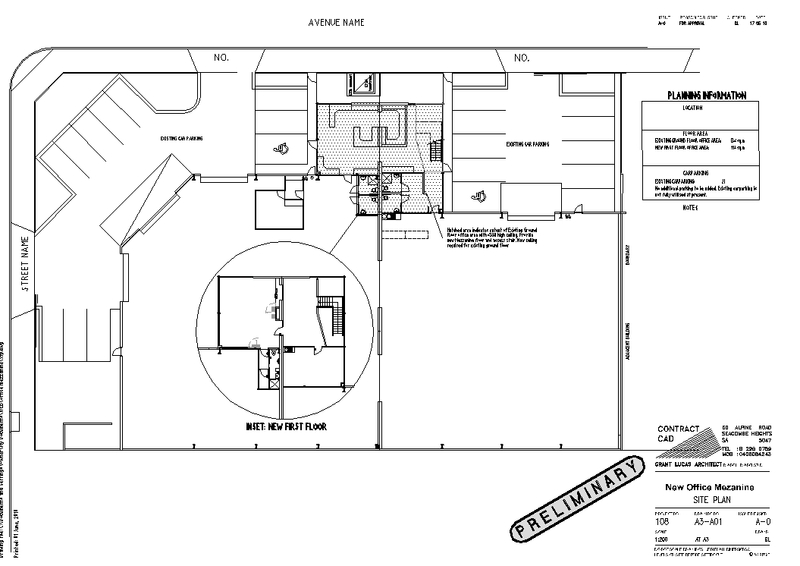 Total cost (GST inclusive) for architectural work to produce this Development Approval drawing set was $2,420. 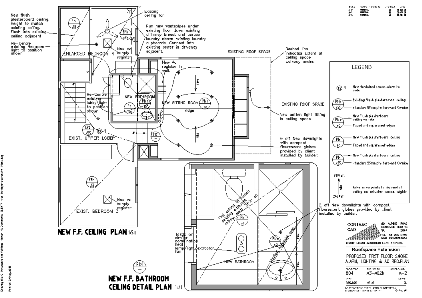 I use Autocad for the drafting work and Sketch-up for 3d design work and Shadow studies. My rates for all the Documentation shown are based on an hourly fee. My rates are $79 per hour GST inclusive. When working for larger firms I am billed out at $120+ an hour before GST. My rates are competative as I work in a S.O.H.O. environment which keeps my overheads down. Why pay $140 an hour and not be sure who is doing the work? If I take on your work I do the work. I will design the building and I will document it. In a large firm these tasks are split between 3 (or more) separate people. Much is lost in translation, you may get an office junior doing the work if they are busy and you still pay full rates. My fee for most jobs comes in between $6K to $12K. This includes jobs from simple 80sq. meter domestic additions up to 3,000 sq. meter office/warehouses. Small jobs are not much cheaper than big jobs. This is because there still is a client briefing and site inspection/measure-up required for whatever you want to do. Typically 30% of the cost is in resolving what the client wants. 30% of cost is getting drawings past the Councils planning approval. 30 percent of cost is the actual Building approval. 10% of the job is coordinating with the Engineer and Private Certifier and making last minute changes. I will give a fixed price quote if requested, but my pricing will have to reflect the standard Architectural fee structure which is based on a percentage of the building cost (modified by its complexity). Usually my hourly rate will give you your documents for a saving of about 30% to 50% of a fixed price fee. Factors such as unexpected Planning issues, Council requests for Shaddow and Carparking Studies, or client requests for re-designs will reduce the amount saved. Basically you get what you pay for and the less you change your mind the cheaper it will be.